• NEW VIDEO: 2014 MST and MSTR In Motion! Check out the first batch of 2014 MST's undergoing final validation (and some joy riding, too). Each machine gets 30k+ miles of intense durability testing so your Motus will be bullet-proof. So far, so good. Utah was picked for its range of altitudes, temperatures, surfaces, and big-sky roads where encountering law enforcement is, um....infrequent. Grab a copy of the fantastic November 2013 issue of Cycle World magazine and check out Andrew Bornhop's article The Motus Position. We were glad to spend some time with Mr. Bornhop and can't wait to throw them the keys again later this fall! "With pushrod V-Four power, the new Alabama-built Moti are the torque of the town." It's no secret we loooove Corvettes, so when invited to the first-ever motorcycle exhibit at the National Corvette Museum, we didn't have to think long. When we later learned the MST would be the Bike of Honor, we were more than humbled. Motus is highly inspired by American sports cars so dominant in endurance racing. Fingers crossed, our friends and partners at Pratt&Miller Engineering and the factory Corvette Racing program are on track to win the ALMS manufacturer's title...again. If you're near Bowling Green between now and 1/3/14, stop by and check out an MST prototype and V4 Baby Block on display. If we had to pick a favorite motorcycle event, it would be, hands down, the Barber Vintage Fest. Please come check out the bikes in the Fan Zone, enjoy the racing, swap meet, museum, and all the other surprises Mr. Barber and his team have planned. Q: Where can I see, test ride, and purchase a Motus MST or MST-R? Motus motorcycles are sold exclusively through existing, high quality dealerships taking reservations now. If your favorite dealership may be a good fit for our new line of comfortable American sportbikes, please let us know here. And, please let them know you want to ride a Motus. Sign up for a test ride when we are in your area at an event or dealer here. Q: What are the differences between the MST and MST-R? The Motus MST and the premium MST-R are comfortable sportbikes designed for long range canyon carving, solo or two up. Both are exhilarating, charismatic machines powered by the mighty V4 Baby Block engine and both are offered with various accessories and upgrade options. Q: What are the retail prices of the MST and MST-R? 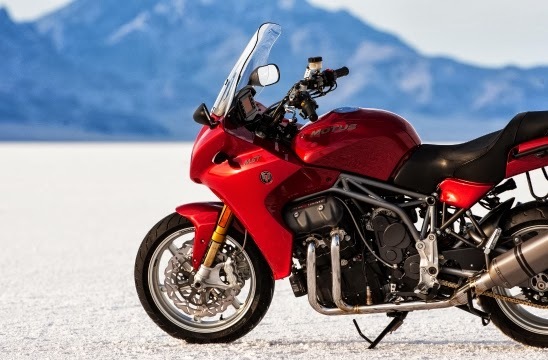 The Motus MST's start at an MSRP of $30,975. Features, accessories of the 2014 MST are here. Features, accessories of the 2014 MSTR are here. Q: Does Motus have plans for an adventure bike, street fighter, trike, hovercraft, or track car? Motus is focused squarely on building comfortable American sportbikes and can neither confirm nor deny any future plans. Q: Can I purchase a V4 Baby Block engine for a different application? Yes, Motus will offer crated, aftermarket engines in limited numbers. Specs and drawings available upon request. Refundable reservations are being taken now for winter 2013 delivery. Click here for the Reservation Agreement or for more information about the MV4 Builder's Kit.